The Seventh Voyage of Pete and Co! 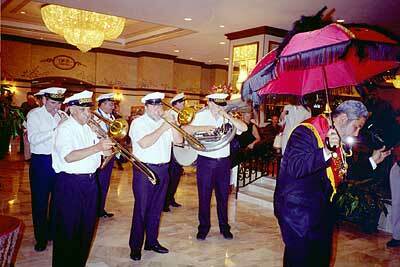 My seventh "Once in a lifetime" trip to New Orleans was in October 2003. Peter Harratt and I were in the "cottage" at the rear of the apartments at St Phillip Street and our good friends Derek and Trish Galloway were in an apartment just across the courtyard. Pete Vickers (bs) joins the Kid Simmon's International Band at the Louisiana Music Factory Having been several times over the past 10 years I have made several firm friends and got to know my way around a little. First stop to Preservation Hall to see John Simmons who asked me to play for his band the following Saturday at the 504 records 25th birthday party at the Louisiana Music Factory on Decatur Street. Of course I agreed and set off in pursuit of Bernie Attridge who had lent me a bass in the past and who was working at Fritzell's on Bourbon Street, just around the corner. Not only did he lend me a bass but also fixed me up with a gig at Fritzell's on the Saturday night. Since Francis and Dutch sadly left us I expected changes at this venue but no the new owner has continued with very few changes. The picture of Rommel is still on the wall and most nights there are two bands of a traditional nature. 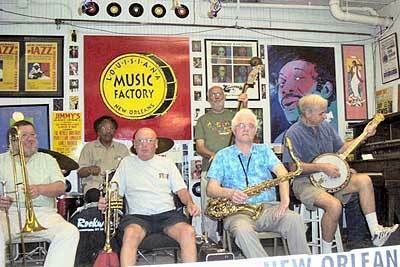 We visited The Maison Bourbon on the corner of St Peters and Bourbon and heard a fine band led by Jamie White with Frank Oxley on drums and spent part of several evenings at The Hall where tourists flock to listen to the men who started the music. That is what the buggy drivers tell them, but whilst the programme is always entertaining there are precious few of the second-generation musicians still around. The Palm Court is still probably the best place to hear traditional bands with good bands led by Lionel Ferbos and others and good food as well. It is OK though just to stand at the bar and have a drink if don't wish to eat. October is jazz awareness month and so Sunday afternoons are to be spent at the Café Brazil down on Frenchman, just outside the Quarter. The Nickel a Dance events has run for a number of years now and this year there were bands led by Henry Butler, Lionel Ferbos, Les Muscutt and Ronnie Magri. This year there was also an extra date over the river at Algiers described by Barry Martyn in the current issue of the Just Jazz Magazine. The dance was preceded by a parade from the ferry terminal led by Andrew Hall's Society Brass Band augmented by Mr Galloway who also played with them at a private function later in the holiday. Market where a series of free concerts was provided or at the Louisiana Music Factory where free concerts featuring local recording artists are also held each Saturday afternoon. After that the strictly traditional music become sparse but not to despair, the best is yet to come! Donna's on a Monday night is as near the "Jazz Heaven" as I have encountered. The Bob French Band are the house band but everyone who isn't working as a musician seems to drop in between 10.00pm and about 2.00am. Leroy Jones, Kermit Ruffins, Herlin Riley; John Boutte: the list is endless. Here on the edge of Treme district, on North Rampart Street, you get a mixture of traditional New Orleans Jazz, street music from the younger brass band tradition, blues, gospel and bee bop. The wonder is that it all blends into a cacophony of music that is wonderful. Peter sitting in with Bob French's Band at Donna's Boisterous but wonderful, thanks to the beat that runs through all good New Orleans music. Donna's has music five nights a week with, in October, Evan Christopher each Thursday playing clarinet, sometimes in a traditional style and then with more than a touch of the Martinique influences. His quartet was made up of wonderful musicians with a Sousaphone player who tempted me to leave the one I had just bought behind in New Orleans. Peter sat in with the house band and acquitted himself very well; you're a braver man than I am Gunga Din! 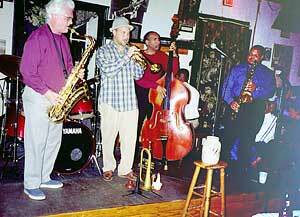 Snug Harbour is where the modern jazz is to be found with two shows each night. 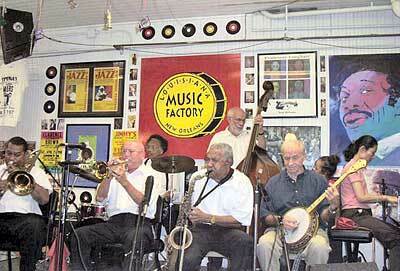 We heard Ellis Marsalis and a wonderful big band led by John Mahoney. Nobody represents the best in New Orleans music better than Kermit Ruffins and I admit to being a groupie, if that is possible at 65? Wednesday night at the rather shabby Maple Leaf Bar off St Charles Avenue, take a taxi, Saturday at the Blue Nile on Frenchman, we caught up with him and his band as often as we could and every night was party night. Mostly Kermit plays at halls that are not demanding on the pocket, $5 admission and buy a drink if you wish. The rooms are packed with young folk from 21 to 71years of age, mostly from the area, with a strong desire to have a ball, and they do! When Kermit plays "Skokian" you can hear Dee Dee Pierce amongst touches of Louis Armstrong et al. We too had a ball. Many cafes and restaurants have bands of varying style and quality and of course there is a lot more music than we hear with the "Offbeat" magazine listing about 50 venues each Saturday and only slightly less on other nights. Derek ready to move off with Andrew Hall's Society Band The most exiting night was Halloween with a parade from Molly's at the Market that took about two hours to circuit most of the French Quarter. It was led by the Storyville Stompers and augmented by all and sundry including Nick Telfer from Whitehaven. The costumes have to be seen, not grand as at Mardi Gras but bizarre beyond belief. The parade started as someone threw handfuls of fake, very large, $20 bills from the balcony and from then on there wasn't a dull moment as the troupes passed by including about 20 belly dancers with Turkish orchestra. Reaching a junction with Conti and Bourbon there was a refreshment halt of about half an hour and then as the band turned into Bourbon Street the band struck up with the Bourbon Street Parade and a little shiver ran down my back. Shaking off the little shiver I hurried on over to Frenchman to meet Peter to pay a visit to Snug Harbour to listen to Ellis Marsalis. The prospect of having more voyages than Sinbad is a tempting prospect, just one more time!!! If you can't visit then go on line to WWOZ radio Station at www.wwoz.org or visit www.neworleansmusic.com for good music and visit www.donnasbarandgrill.com for a sample of Monday Night at Donna's.